Telling the difference between earwigs and silverfish is relatively easy, as they don't look much alike. Their bodies both boast prominent appendages, but they aren't the same size or number. Silverfish cause far more damage indoors than earwigs, although the latter can devastate gardens. Getting rid of an infestation of either insect in your home generally requires the services of an extermination professional. Not surprisingly, silverfish are usually silver, although some tend toward a brownish shade. At maturity, silverfish range between a half-inch and three-quarters-inch long, with flat, scaly bodies and no wings. They're easily identified by the two large antennae sprouting from the head and the three long antennaelike projections in the rear. Juvenile silverfish look much like adults but smaller. There's a definite "ick" factor with earwigs. Not only can they emit a bad odor when bothered, but they sport large pincers on their hind ends. If an earwig pinches you, you will feel it. However, they don't generally attack humans. While there are various species of earwigs with different coloration, they all have those forcepslike appendages. 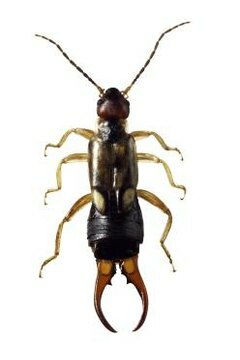 Earwigs grow to about three-quarters-inch long and are usually brown, black or striped, according to the species. They might or might not have wings. You're far more likely to find silverfish in your house than earwigs. The latter insect prefers life outdoors, although they can infest buildings. Silverfish live in dark, wet areas, so basements, kitchens and bathrooms are where they're usually found in a home. Because they're nocturnal, you might not realize they're infesting your dwelling unless you find a dead one, or discover their pepperlike droppings around food sources. Earwigs also like damp places but are more often found in gardens, firewood piles and mulch. As the Iowa State University website puts it, "The earwig is a household pest as an accidental invader." Because they like light, earwigs are usually found clustering around outdoor lighting on porches or decks. Indoors, silverfish eat carbohydrates, which includes paper, books, natural fabrics, wallpaper and stored dry food. They're the insects you might find in an older, unopened package of pasta or cereal. They also eat other dead bugs and house dust. However, silverfish can go months without eating. Earwigs will feast on silverfish, but they don't consume common household articles. If found indoors, they are more a nuisance than a destructive pest.